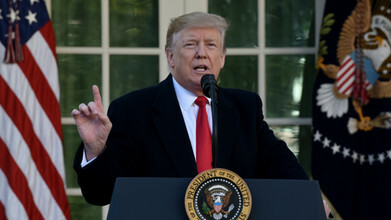 President Trump on Sunday blasted a pair of Fox News reporters over their coverage of the border wall negotiations, claiming that they have "less understanding" than journalists at "fake news CNN & NBC." "Never thought I'd say this but I think [John Roberts] and [Gillian Turner] have even less understanding of the Wall negotiations than the folks at FAKE NEWS CNN & NBC!" Trump tweeted, referring to two of the news network's top correspondents. "Look to final results! Don't know how my poll numbers are so good, especially up 19% with Hispanics?" Trump continued, referring to a poll published earlier this month that found a growing number of Latino adults approved of Trump's job performance.